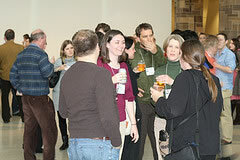 MW2010 included many different opportunities to meet – and learn from – professional peers, and to build a personal network. Pre-conference Tours, Lunch during the pre-conference workshops, an Orientation Session for first time attendees, the Welcome Reception, Exhibitors' Reception, Birds of a Feather Lunch, and the Conference Reception were great chances for socialising. There were formal Sessions and less formal Interactions throughout the conference. The day before the Pre-Conference Workshops, local cultural and scientific institutions teamed up to provide attendees at MW2010 with behind-the-scenes tours of some of the most interesting new media programs around. Tours were a great chance to share experiences with other delegates in an informal environment. MW2010 tours visited the Denver Museum of Art – focusing on current web, in-gallery and new media technology applications – and the Denver Museum of Nature & Science: Expedition Health Exhibit – one of the more technology intensive museum exhibits in the country, with interactive, media presentations, and 2 theaters. Participants met staff from both institutions. 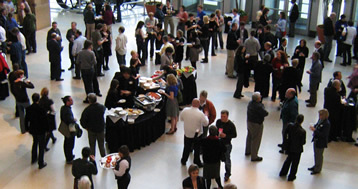 Throughout MW2010 there were numerous social events – as well as lots of coffee breaks in the program – to make sure that everyone had a chance to connect with other attendees. During the pre-conference workshops registrants sat down for lunch to talk about what they've learned. All pre-conference workshop registrants, including those registered for half-days in the morning and/or afternoon, were invited to join the lunch. An informal session designed to orient first-time attendees and help them get the most out of the conference took place on Wednesday. A few old hands explained how to make best use MW and answered questions. A buddy system was be available, to match up newcomers with people more experienced with shared interests. The evening after the pre-conference workshops, and before the first full day of sessions, MW2010 kicked off with a Welcome Reception. 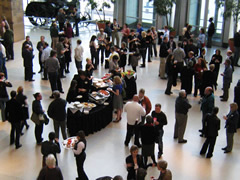 It was a great chance to reconnect with old friends and make some new contacts, while exploring the Denver Art Museum. Delegates also were able to play with Paint Out- Virtual Graffiti. 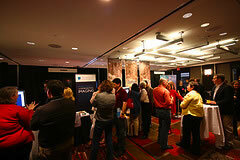 A reception sponsored by the Exhibitors opened the Exhibit Hall. 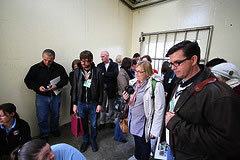 It featured new products, services, and designs, in a concentrated gathering of interactive multimedia museum vendors. The Exhibit Hall was open all day on Friday, April 16, 2010. 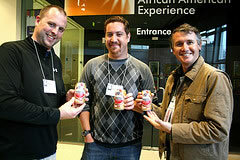 On April 16, 2010, colleagues got together to talk about topics of common interest. 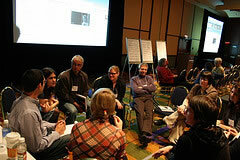 Each table was devoted to discussion on a theme proposed by attendees. MW2010 delegates headed out for an evening in a local museum. We celebrated the conference and cemented ties in our community, while exploring the Denver Museum of Nature & Science. Throughout the conference a room was set aside to check your e-mail, and for speakers to test their presentations. Speakers had priority access to the computers provided. WiFi access was available throughout MW conference areas of the hotel.